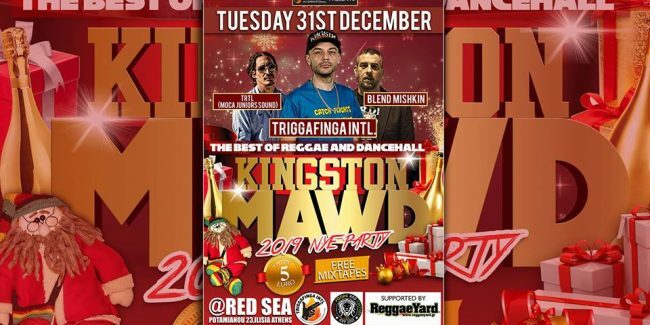 Kingston MawD NYE 2019! | Triggafinga Intl, Blend Mishkin, Trtl! 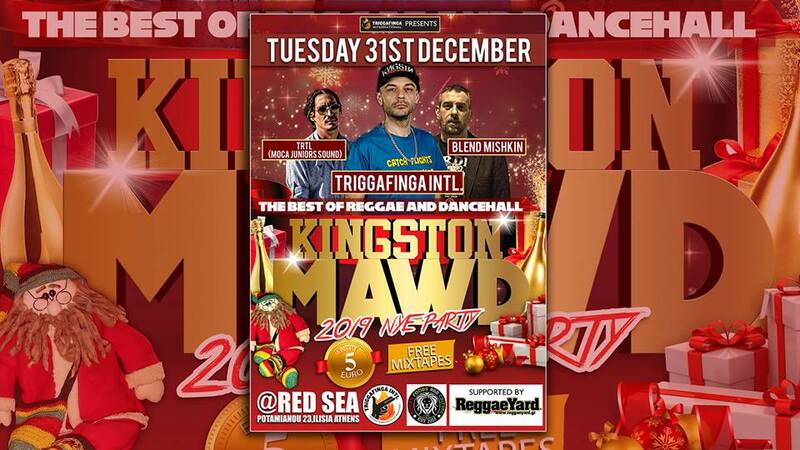 KINGSTON MAWD – 100% authentic Jamaican music! 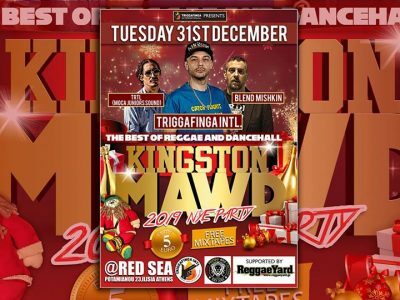 Founded in 2006, Triggafinga Intl, is performing regularly around the globe, from Italy, Germany, UK, Switzerland, Portugal, Holland, Greece ,Spain, Belgium, to Norway, Canary Islands and Jamaica. He owns one of the deepest duplate boxes in Europe and he’s one of the very few sounds worldwide able to present a variety of hip hop dubplates as well. Winner of many European Sound Clashes like the “Amsterdam Soundclash”, the “King of the Mountain” in Austria & the “Unreal Soundclash” in Italy, while in 2018 he took part in the Euro Rumble (European Finals) in Germany. He has participated/organised a number of events with artists like Freddy McGregor, Alborosie, Tarrus Riley, Sizzla Kalonji, Buju Banton, Luciano, Ward 21 and more while he has released a series of successful mixtapes, also was featured twice on Seani B’s radio program at BBC Radio 1Xtra. He has collaborated in Red Bull contests and has organised twice the Italian Dancehall Queen Contest finals in 2004 & 2005. Blend Mishkin is a top Greek Dj and producer, being active for over two decades. He has appeared as a dj or with his band (Roots Evolution) in lots of venues in Greece and abroad. He has also participated in some of Europe’s biggest festivals. His productions have been very successful and gained airplay all over the world. He has collaborated with artists like Gappy Ranks, Exco Levi και Skarra Mucci and worked on remixes for Dub Pistols, Wax Tailor, Mr. Williamz και DJ Spooky. His work has been released on top label like Nice Up!, Irish Moss, Totally Dubwise, Pork Recordings, Tru Thoughts and Shadow Records. His latest album “Survival Of The Fittest” received excellent reviews and has been played by the top radio producers David Rodigan, Toddla T and Seani B of BBc Radio 1Xtra. TRTL aka Turtle is an MC (deejay) and member of Dancehall crew Moca Juniors Sound based in Greece and founded back at 2006. He have perfomed in many venues and festivals all around Greece and Cyprus and shared the stage with many great International and local artists like Earl Sixteen, Mungos Hi Fi , Kanka, Dub Pistols, Professor Skank, African Simba, J Star, Blend Mishkin and more. His discography include songs like «Circle», «MOCA», collaborations with Filter Effect, Dj TheBOY, N.O.E. and more.